After many weeks we have finally arrived at the final review of Series 1-2 figures. Just getting this figure pack was difficult. In all the Toys R Us near me, they never had this one stocked. Recently, I went into Meijer for some food and checked their World of Nintendo stock and sure enough, they not only restocked all of 1-2, but had the rarest ones there too. Many people have not gotten as lucky as me and I have to say, this is one of the rarest Micro Land releases I have seen. Of course, I missed Series 1-1 and don’t know how hard those were to get, but outside of that, this is definitely the toughest. But enough about rarity, let’s look at the figures and see if they are worth hunting down. Red Koopa Troopa – Starting with the simplest figure first, the Red Koopa Troopa has a nice pose and looks like he is patrolling his area just like in every Mario game. My Koopa Troopa has a nearly flawless paint job with maybe just a little more paint needed on his chest. Overall, I think this figure is pretty cute (which is not something I say a lot about these annoying enemies) and I think just about anybody can use this in their collection since Koopa Troopas are so common. Penguin Luigi – While he doesn’t have the dynamic pose that Mario does, Luigi looks cute with his flippers out. One advantage Luigi does have over Mario is a superior paint job with almost no issues. The yellow paint on his feet and bill are the spots to look out for potential flaws if some reason you win the Micro Land lottery and somehow have multiple figure packs to choose from. 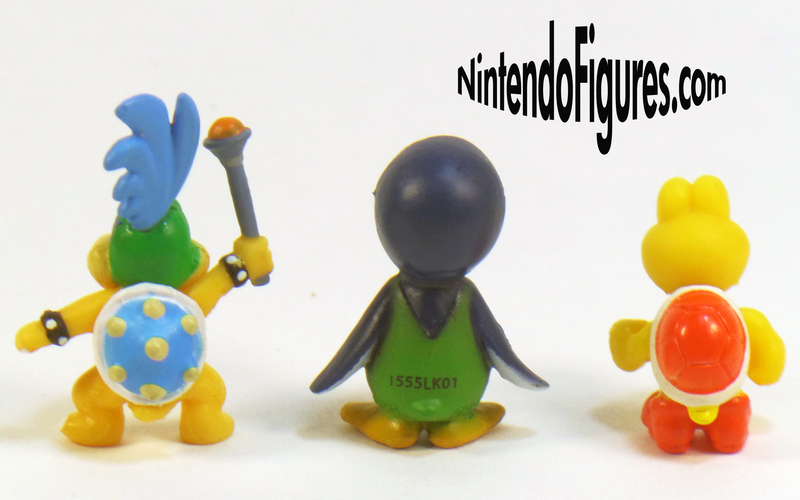 Luigi does have the factory numbers on his back like one figure in all of the other figure packs have, but they aren’t too obnoxious or noticeable. 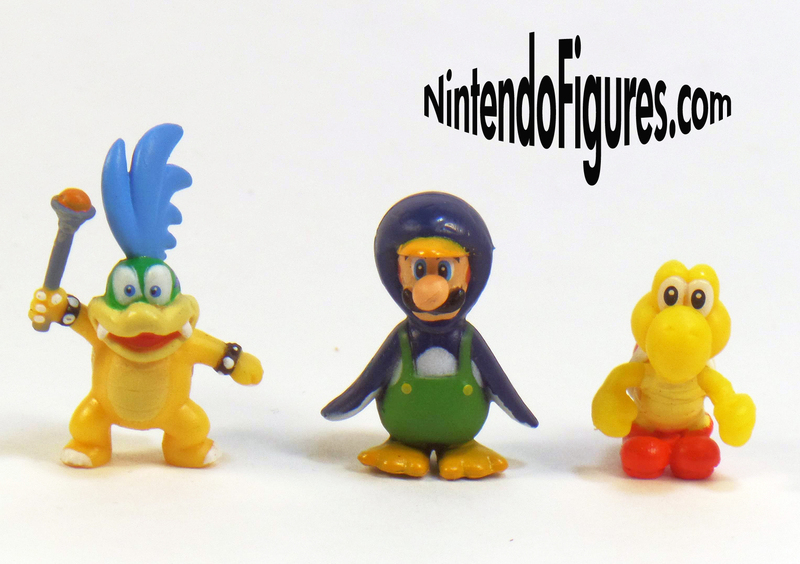 Larry Koopa – That brings us to what I think is the most sought after figure in the pack and in Series 1-2. Larry has a fantastic paint job and the only flaws on mine seem to be on his staff and toenails. His pose is great and captures the feel of several boss fights in the Mario games. What impresses me is how fine details like his eyes are not crooked and his visible fingernails are well painted. Larry also has a star on the side of his face which was a nice detail. Even compared to Morton, Larry is just a little higher quality and really well done. If Jakks can deliver more figures of this quality in the future, collectors of Micro Land will be happy. Closing Thoughts – It took me months to buy this pack and in many ways, I would say it was worth the wait. These figures are some of the very best Jakks Pacific has ever released. If you have the opportunity to buy this, especially for its retail price, I can’t recommend getting it enough. However, I know that scalpers are sitting on these and trying to sell them for a fair amount of money. I don’t know what this figure pack is worth or what price you should pay if you dip into that market. I’ve seen it for $20 and I don’t think that is outrageous for how good they are, but $10 seems a lot more reasonable than over triple the retail price. Giving into scalpers or not is a tough decision and one I had been considering for quite some time before I found this at retail so I don’t envy any collector in that position. With that said, let’s talk briefly about Series 1-2 as a whole. There are a lot of minor annoyances with the figures. The first is that the paint quality varies wildly from pack to pack and finding figures that don’t have flaws can be nearly impossible. The factory numbers are even worse in Series 1-2 though. A few of them nearly ruin what would otherwise be an awesome figure. There is also no doubt that the coolest figures come in the rarest packs which is a shame because it feeds into scalpers and it means kids and collectors both have a harder time finding what they really want. These figures fit in well with the Series 1-2 playsets and are pretty versatile for display purposes. What is encouraging is that Jakks Pacific is improving the quality of figures over time as you can see in my review of the first Link figure and Wind Waker playset. So it is good to know the weaknesses of Series 1-2 and have realistic expectations, but also encouraging to know that most of these issues will no longer be a concern in the future. I hope you have enjoyed the Series 1-2 reviews and please let us know your thoughts on this series in the comments section.